Baby Ava is the moving and insightful account of Caroline and Niall O'Flaherty's struggle to have a baby. Faced with infertility after Caroline's battle with cervical cancer, the couple begin to explore various options. However, with the usual pathways of IVF and adoption proving too problematic, all hope seems lost until Caroline happens to see a TV documentary about surrogacy in India. Buoyed by… the possibility of a child, the pair contact the Akanksha Infertility clinic run by Der Nayna Patel and set about making arrangements to travel to India. This book details their remarkable journey through the surrogacy process, from Caroline and Niall's first trip to India, to the arrival of their beautiful daughter. Following Ava's birth, however, the O'Flaherty's meet a further obstacle; with no surrogacy legislation in place in Ireland, they cannot obtain an Irish passport for their child. Niall immediately embarks on a campaign to bring his family home, as Caroline adjusts to motherhood while stranded in a foreign land. The O'Flahertys' story is both poignant and powerful. 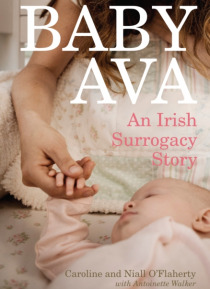 Their personal exploration of this emotive issue provokes thought on the wider questions of morality and ethics surrounding surrogacy, making Baby Ava as enlightening and challenging a read as it is heartwarming.